Scientists have created a toaster oven-sized lab for a Mars rover that will drill beneath the surface of the red planet and look for signs of past or present life. The tiny chemistry lab called the Mars Organic Molecule Analyser (MOMA) is a key instrument on the ExoMars Rover, a joint mission between the European Space Agency and the Russian space agency Roscosmos, with a significant contribution to MOMA from NASA. It will be launched toward the Mars in July 2020. "The ExoMars Rover's two-meter deep drill will provide MOMA with unique samples that may contain complex organic compounds preserved from an ancient era, when life might have gotten started on Mars," said Will Brinckerhoff, project scientist at NASA's Goddard Space Flight Center in the US. 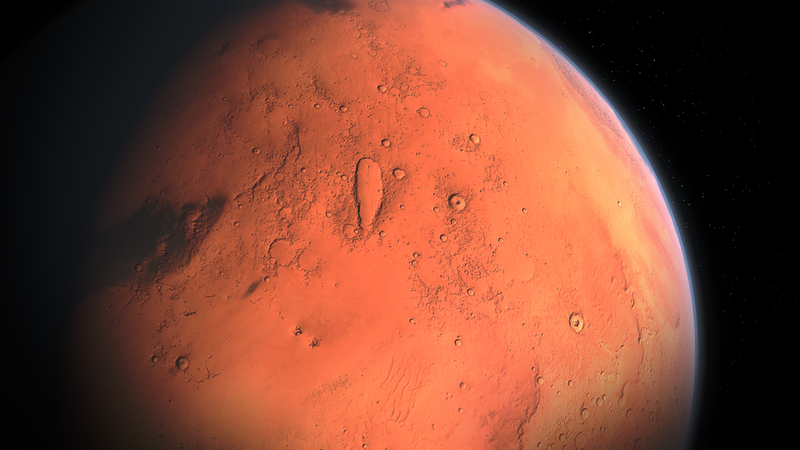 Although the surface of Mars is inhospitable to known forms of life today, there is evidence that in the distant past, the Martian climate allowed the presence of liquid water - an essential ingredient for life - at the surface. This evidence includes features that resemble dry riverbeds and mineral deposits that only form in the presence of liquid water. NASA has sent rovers to Mars that have found additional signs of past habitable environments, such as the Opportunity and Curiosity rovers both currently exploring the Martian terrain. The MOMA instrument will be capable of detecting a wide variety of organic molecules. Organic compounds are commonly associated with life, although they can be created by non-biological processes as well. Organic molecules contain carbon and hydrogen and can include oxygen, nitrogen, and other elements. To find these molecules on Mars, the MOMA team had to take instruments that would normally occupy a couple of workbenches in a chemistry lab and shrink them down to roughly the size of a toaster oven so they would be practical to install on a rover. Mars rovers face another challenge when searching for evidence of life: contamination. Earth is saturated with life, and scientists have to be very careful that the organic material they detect was not simply carried with the instrument from Earth. To ensure this, the MOMA team has taken great care to make sure that the instrument is as free as possible from terrestrial molecules that are signatures of life. The ExoMars rover will be the first to explore deep beneath the surface, with a drill capable of taking samples from as deep as two metres. This is important because Mars' thin atmosphere and spotty magnetic field offer insufficient protection from space radiation, which can gradually destroy organic molecules left exposed on the surface. However, Martian sediment is an effective shield, and the team expects to find greater abundances of organic molecules in samples from beneath the surface. MOMA recently completed both ESA and NASA pre-delivery reviews that cleared the path for the flight instrument to be delivered to the mission. On May 16, the MOMA mass spectrometer was delivered to Thales Alenia Space in Italy, where it will be integrated into the rover's analytical laboratory drawer during upcoming mission-level activities this summer. Following subsequent higher-level rover and spacecraft-level integration activities in 2019, the ExoMars Rover is scheduled to launch to Mars in July, 2020 from the Baikonur Cosmodrome in Kazakhstan.